Yeah, exactly. He’s a guy who really showed up, he bailed us out a lot, had a good game. But, again, I felt we hung him out to dry far too much, especially at the end of the game. It was always going to be difficult for the revamped Union to win the opener. They had never defeated the Dallas, a team that had the best record in the Western Conference during the regular season and were Western Conference finalists for the MLS Cup in 2015. On Sunday, Dallas was all too quickly running the show, with two big saves from Blake the difference before a Fabinho turnover finally gave the home team the opportunity to demonstrate their canoe-paddling form in the 22nd minute. Blake would make two more first half saves, and open the second half with another pair of stops before the 51st minute. The Union goalie did exactly what he was supposed to do, and Philly briefly looked like they would build on his performance to get back into the match. Then the “hung him out to dry” part came in the 79th minute when another Fabinho error, this time in his own box, allowed Dallas to put the match to bed. On the day, Blake made 8 saves from 10 shots, tying him with Montreal’s Evan Bush for the most on the day. 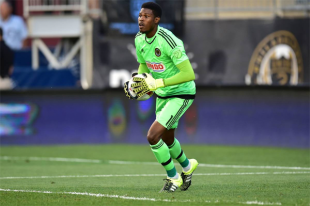 Blake had to wait a surprisingly long time before taking over as the Union’s number one stopper, but he showed that he is ready for the responsibility with a huge opening week performance. “Andre Blake bailed us out a lot tonight, you need that in this league, especially when you go on the road,” Curtin said on Sunday. And that’s why Blake is PSP’s Player of the Week. On the road or at home, the Union will need more performances from Blake like we saw on Sunday while they find their feet. And when more of his teammates also “really show up,” such performances will be the difference between a win and a draw, instead of a not unexpected result and a scoreline that is embarrassing. He’ll win more of these than games. Yea but will he do it for the Union? Won’t be with Union long…won’t be in MLS long. Not much wrong with his game…lil slow reading game and off line but that will better soon enough. Unfortunately he’s gonna be fun to watch this year. When your goalie wins POTW in a 2-0 loss…. …you know EVERYTHING you need to know.